Joe Porter, 84, passed away peacefully in New Albany, Ohio, October 2, 2018. Joe was born December 14, 1933 to Howard and Betty Porter in Fostoria, Ohio. He started spending his summers on Lake Margrethe when he was 6 months old and never lost his love of the Lake and the Grayling community where he became a full time resident in 1998. After graduating from Fostoria High School, he attended The Ohio State University where he was a member of Phi Delta Theta fraternity and NROTC and earned a BS degree. Joe served in the Navy from 1956 to 1958 as a LTJG Navy Supply Corps. After the Navy, Joe started his sales career in Grand Rapids, Michigan. Not long after moving to Grand Rapids, Joe met Susan Whinery and fell in love over discussions about fly-fishing on Michigan’s rivers. They were married for almost 59 years. 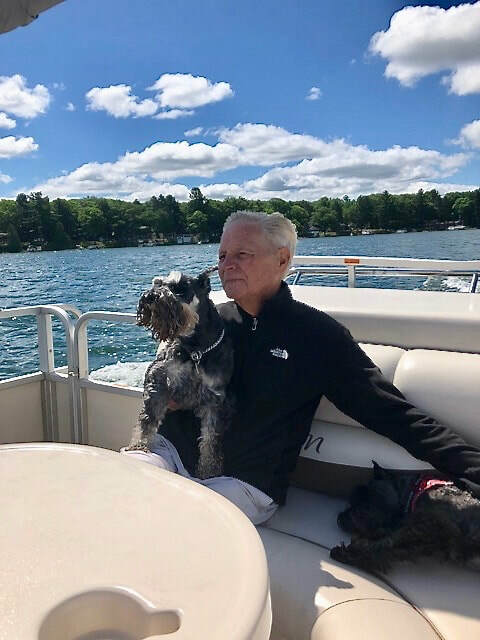 While Joe had a very successful business career in both Pittsburgh and Grand Rapids, he will be remembered for loving his family and schnauzers, creating friendships with everyone he met and for his service to others. Joe was a long time Boy Scout Master receiving the Silver Beaver Award in 1987. He was a member of Eastern Star serving as Treasurer and Grand Representative Louisiana in Michigan and a long time Mason and Shriner joining the AuSable Shrine Club in 2001 where he was Secretary and Treasurer and received many local and state awards. He served on the Mercy Hospital Grayling, Board of Trustees (2001 - 2010) and Shawono Center Citizens Advisory Council (1998-2016). He was also a member of the Grayling Rotary Club (1999-2004) and served on the North Central Michigan Community Foundation and Crawford County Community Foundation boards. Joe’s love of Lake Margrethe led him to serve as a Director of the Lake Margrethe Property Owners Association for 29 years, 17 of those as its President and helped to create the Lake Margrethe Foundation where he also served as President for a number of years. Joe is survived by his wife, Sue, children Sue Porter (Mike Sayre), Scott Porter (Kathy) and John Porter, grandchildren Nicole, Sarah and Mitchell Porter, Kennerly, Evan (Susan) and Lily Sayre, and his faithful companions Major and PJ.